FARMINGTON -- More than 3,000 endangered roundtail chubs are swimming in their native waters of the San Juan River this month following a successful release of the large minnows by the New Mexico Department of Game and Fish. 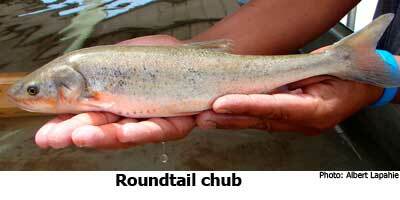 Roundtail chubs (Gila robusta), grow up to 12 inches long. They historically occurred throughout the Colorado River basin, including the San Juan River and its tributaries in New Mexico, Colorado, and Utah, but have been rare or absent in recent years. The species was listed as threatened under the New Mexico Wildlife Conservation Act in 1975 and uplisted to endangered in 1996. The chubs released Oct. 21 were two to three inches long, bred from chubs found in the Navajo and La Plata rivers and raised in the Colorado Division of Wildlife Native Species Hatchery. They were stocked in the San Juan River near the confluence with the Animas River, high in the system in the hope that they will disperse downstream into suitable habitat. Loss of roundtail chub populations in New Mexico has been attributed to poisoning that occurred before the impoundment of Navajo Dam, habitat loss and fragmentation, modified thermal regime, and predation by non-native fish. The recent stocking was part of a cooperative agreement among the New Mexico Department of Game and Fish, the Jicarilla Apache Game and Fish Department, Southern Ute Tribe Division of Wildlife Resource Management, and Colorado Division of Wildlife. Also in 2009, Jicarilla Apache Game and Fish Department and Southern Ute Division of Wildlife Resource Management stocked more than 20,000 fish from the same group in tributaries on tribal land, as well as completing habitat enhancement projects. Viewers will have another chance this month to watch "New Mexico Wildlife" the Department of Game and Fish television show that runs statewide at 6:30 a.m. on KASA Fox Channel 2 every Saturday. KENW, Eastern New Mexico University’s PBS station, will show episodes at 6:30 p.m. every Sunday. This month, viewers will have see river otters and native trout return to the Rio Grande. November episodes also include game wardens capturing a bear in Los Ranchos, monster tiger muskies in Bluewater Lake, Mexican wolves released in the Gila Wilderness, and much more. A trophy buck hangs in the family room after a successful father-daughter hunting trip. A black bear in Los Ranchos is captured by game wardens. Dan Brooks, the Cast Iron Ranger, cooks up some enticing teriyaki venison on the camp stove. Check out the Petroglyph National Monument in Albuquerque. Witness river otters, once extinct in the state, being released on Taos Pueblo as part of multi-agency effort to reintroduce otters to their native areas. Catch a spring trout fishing trip on the Pecos River in Northern New Mexico during a snowstorm. Watch the Cast Iron Ranger and Bobby Griego cook up some tasty red chile venison. Learn about the Southwest Birding Trail. Check out the monster tiger muskies at Bluewater Lake. Learn to identify the state’s four species of quail. Cook up some easy-to-make “Make-Do Green Chile Stew” with the Cast Iron Ranger. Tour the Guadalupe Scenic Byway in southeastern New Mexico. Catch fall fly-fishing on the Rio Grande and winter bass fishing at Ute Lake. See how mules are used to pack Mexican wolves into the Gila Wilderness. Find out how to make sourdough biscuits in a Dutch oven with the Cast Iron Ranger. “New Mexico Wildlife” segments also are available 24-7 on www.Myoutdoortv.com.